This is the Signed original Watercolour painting by John Worsley. 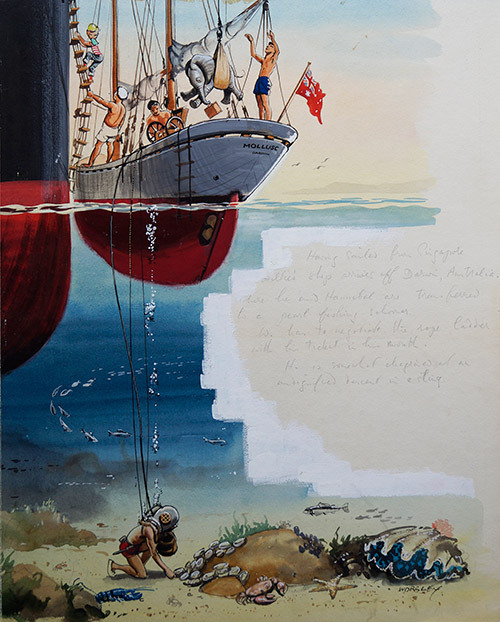 Wee Willie Winkie and his Baby Elephant friend Hannibal board the Australian oyster diver's boat 'Mollusc' in order to get a closer look at the ins and outs of pearl diving off the coast. This lovely watercolour showcases Worsley's strengths both using washes and precision strokes. The incredible detail with which the rigging and text are executed contrast remarkably with the more fluid figures and marine life. The pencilled caption is still laid up on this board, adding a historical feature and providing the illustration board with further context.